oen is a force to recon with when it comes to production of high quality, elegant and greatly performing plumbing materials, most notably bathroom fixtures. If you are looking for a great handheld shower to purchase then you can try the Moen DN8001CH Home Care Pause Control Hand Held Shower. It is designed to be idea for home care thanks to its wonderful and innovative features and specifications. Let us discuss some of its greatest features. Moen DN8001CH features innovative technologies that allow is to produce shower water at high pressure with jets designed to deliver different sprays patterns to make your bath experience invigorating and refreshing. The showerhead features an exclusive head containing on and off switch that allows you, the user, to instantly stop or slow water and then resume flow to the shower sprayer. It also allows you to keep secure grip, a feature enabled by the fixture’s soft-grip handle and safety strap. The main advantage of installing this showerhead is its security. It features a safety strap for a secure grip that ensures it doesn’t slip off the hand of whoever is using it. That means even kids and the elderly can use it comfortably. Its 7-foot hose allows more room for movement and flexibility compared to all the other showerheads that have been reviewed. It also features a very great glacier finish as well as a limited lifetime warranty. Moen DN8001CH is designed with practicality and safety in mind. This means it is ideal for home care as almost any member of the family who is capable of using the bathroom unaided can use it. This Moen handheld showerhead is available in a chrome finish that is mirror-like to enhance and add contemporary touch to your bathroom. The design also features extra-long flex-soft hose that offers ample reach for caregivers or for those who would wish to shower while sitting. Installation is simple and pretty obvious as long as you can read the instruction manual to comes with the handheld shower. You don not need to hire the services of a professional plumber but you can if you are not confident you can handle it. It is equipped with many safety features making it ideal for home care. 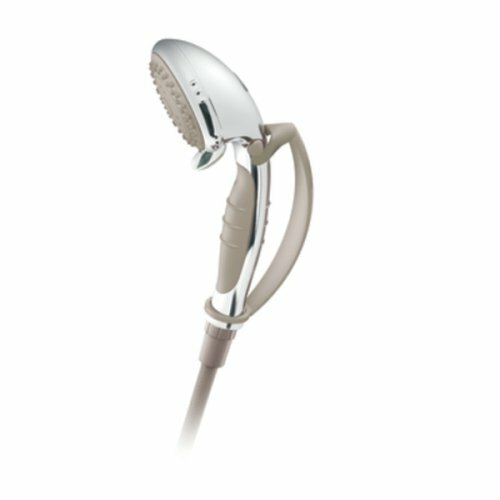 The handheld shower head is lightweight and has a soft-grip handle with safety strap to enhance safety. It comes with an extra-long hose that improves maneuverability. It is backed by the manufacturer’s limited warranty on purchase. It is constructed of plastic, which may not be as durable as other stronger materials such as metal. Pressure control for some units may not work well and this may lead to unusually low pressure. Moen is known to produce high quality stuff. If you want to enhance the interior décor of your room then you can try the Moen DN8001CH Home Care Pause Control Hand Held Shower. It is specially made for home use and it has features that make it safe for use by all members of the family including those handicapped in one way or another.